In October the Ostrogorski Centre participated in the Sixth International Congress of Belarusian Studies, the largest annual conference on Belarus in the social sciences and humanities. Its analysts presented analytical papers on Belarus-Russia disintegration and non-formal education in Belarus. It also offered its earlier printed publications to Congress participants. Over the past months, analysts have also written about topics such as the rhetoric of Belarusian diplomacy in the UN, the long standing dispute between Russian and Belarus regarding the Single Air Defence System, state policies more sympathetic towards the Belarusian language, and other issues. Igar Gubarevich analyses the rhetoric of Belarusian diplomats at the UN. Most challenges now facing Belarus stem from the regime’s outdated economic policy, its ill-judged and unreserved affiliation with Russia, and chronic neglect of national identity issues. However, Belarusian diplomats prefer to play at global politics and use the UN as a rostrum to blame their country’s economic, social and security deficiencies on Western induced “global chaos”. This attitude may placate Russia and help Belarus secure sympathies from certain third-world nations, but is unlikely to strengthen Belarus’s position at the UN. Siarhei Bohdan argues that Minsk prevailed in a long standing dispute with the Kremlin on how best to secure the Belarusian segment of the Single Air Defence System should the Belarusian Air Force not have enough planes. It will apparently receive new planes for the Belarusian army rather than a Russian air base. This information is based on a report by Bellingcat claiming that Russia has withdrawn its fighter jets from Belarus, as well as a report leaked from the Belarusian parliament revealing that Minsk had included the cost of state-of-the-art Russian fighter jets in the next year’s national budget. Ryhor Astapenia argues that the authorities are currently changing their policy towards the Belarusian language. The appointment of Alena Anisim of the Belarusian Language Society to the Parliament shows that the Belarusian authorities do favour gradual measures promoting Belarusian. However, these measures may not necessarily lead to a revival of the Belarusian language, but rather simply prevent it from disappearing from the Belarusian education system. On 7-9 October the Ostrogorski Centre took part in the Sixth International Congress of Belarusian Studies (Kaunas, Lithuania), the largest annual conference on Belarus in the social sciences and humanities. On 7 October Ryhor Astapenia presented a paper entitled ‘Belarus-Russia relations after the conflict in Ukraine’ in the section on regional cooperation and national security. On 8 October Yaraslau Kryvoi and Vadzim Smok presented an analytical paper called ‘Non-formal education in Belarus: expanding the learning space’. Paul Goble provided a brief overview of Ryhor Astapenia’s paper, “Belarusian-Russian Relations after the Ukrainian Conflict”, for Eurasia Review. He summarised the study’s main findings, which indicate a process of gradual disintegration between Belarus and Russia. On the Political Mirror programme on Polish radio, Ryhor Astapenia discussed who won in the recent oil and gas war, what Minsk can gain from cooperation with Warsaw, and why Lukashenka wants to change the constitution. Thinktanks.by quoted Ryhor Astapenia’s presentation at the Sixth International Congress of Belarusian Studies. According to Astapenia, Belarus and Russia are undergoing a process of disintegration in economic, military and foreign policy spheres; this is the result of the formation of Belarusian statehood. Nevertheless, this change will not lead to a profound break in relations with Moscow, as Belarus is still dependent on the Russian market. Belarus will always seek to maintain good relations with Russia. Igar Gubarevich discussed Belarusian authorities’ contacts with the diaspora on Polish radio. Ever since the Ministry of Foreign Affairs has taken charge of maintaining good relations with Belarusians abroad, contacts have become more frequent. An advisory council for Belarusians abroad was established several years ago. However, the authorities invite to the council only those Belarusians who are loyal to the current political regime in Belarus, while Belarusians from the UK or the strong American community are not represented at all. In the Political Mirror programme on Polish radio, Ryhor Astapenia discussed the activity of Belarusian diplomats in relation to the US, the situation of Belarusian prisons, the state of Belarusian banks, and a change in Aliaksandr Lukashenka’s image. The BelarusProfile.com database now includes the following people: Aliena Anisim, Hanna Kanapackaja, Piotra Piatroŭski, Mikalaj Ulachovič, Ihar Marzaliuk, Uladzimir Japryncaŭ, Michail Dzemčanka, Aliaksiej Alieksin, Viktar Piatrovič. We have also updated the profiles of Mikalaj Aŭtuchovič, Ryhor Astapienia, Uladzimir Arloŭ, Aliaksandr Aliesin, Aliena Tankačova, Valiancin Akudovič, Dzmitryj Holuchaŭ, Aliaksandr Cacocha, Jury Hubarevič, Arkadź Dobkin, Stanislaŭ Bahdankievič, Valier Bulhakaŭ, Hienadź Buraŭkin, Alieś Bialiacki, Valier Vakĺučyk. Aleh Mazol. Spatial wage inequality in Belarus. BEROC, 2016. Kirill Shakhnov. The tax system of Belarus. BEROC, 2016. Uladzimir Akulich, Yulia Yafimnenka, Katsiaryna Alieksiatovich, Viktoryia Smalenskaya, Uladzislau Ramaniuk, Alieś Aliachnovič, Sierž Naŭrodski. The sixth issue of the Macroeconomic Review of Belarus (January-June 2016). CASE Belarus, 2016. Uladzimir Akulich, Yulia Yafimnenka, Viktoryia Smalenskaya, Uladzislau Ramaniuk, Alieś Aliachnovič, Sierž Naŭrodski, Katsiaryna Alieksiatovich, Yaraslau Mialhui. Economic trends in Belarus (Issue 2, September 2016). CASE Belarus, 2016. Ina Ramasheuskaya, Natallia Rabava. A new approach to professional development of civil servants in Belarus. BIPART, 2016. 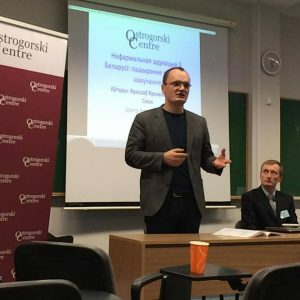 The Ostrogorski Centre is a private, non-profit organisation dedicated to analysis and policy advocacy on problems which Belarus faces in its transition to market economy and the rule of law. Its projects include Belarus Digest, the Journal of Belarusian Studies,BelarusPolicy.com,BelarusProfile.com and Ostro.by.